The east Kimberley is 121,000 square kilometres of beautifully remote country where you can experience a kaleidoscope of outback adventures and behold many breathtaking attractions. 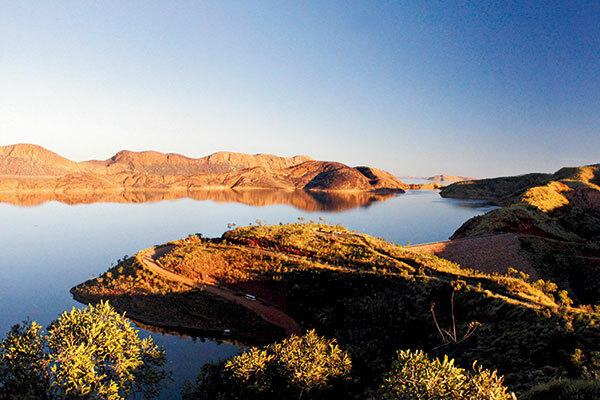 One of these you’ll have trouble missing is the amazing Lake Argyle, a man-made reservoir that covers a vast expanse of historic Argyle Downs Station. 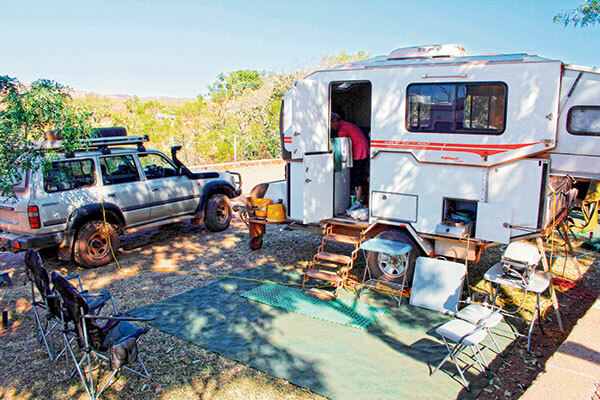 And not only is it big, it’s easily accessible too, only 70km from Kununurra on sealed, all-weather roads that you can drive in the average family sedan. This village lies at the end of Lake Argyle Road, a 35km scenic drive into the crag-lined valleys of the Carr Boyd Range. Just beyond the village is a lookout perched on a ridge above the dam, presenting a panoramic view of these drowned mountains – a strange tableau resembling a desert fjord filled with islands. To fully appreciate how this extraordinary landscape came to be, just consider its dramatic geological history: this part of the east Kimberley was originally formed over 350 million years ago, when a massive upheaval created the Halls Creek Fault, which runs the length of Lake Argyle. For countless millennia, the Ord River has traced a winding path through this terrain, from its headwaters below Mount Wells, to the Joseph Bonaparte Gulf. 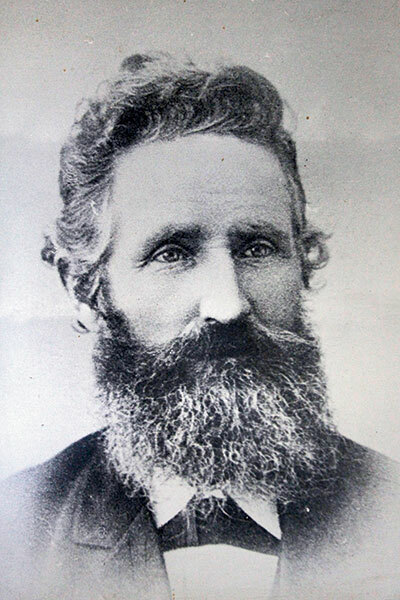 The river itself was named in honour of Sir Harry St George Ord, governor of Western Australia (1877-80), by European explorer Alexander Forrest, who described it in his journal as “this magnificent stream”. It certainly is that. 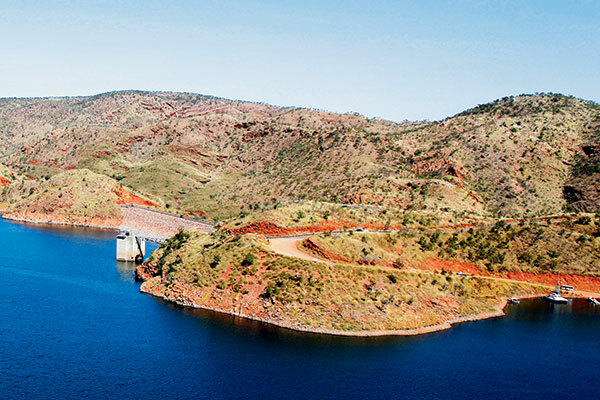 Modern-day Lake Argyle was created by the damming of the Ord River in 1971, as part of the Ord River Irrigation Scheme. The Top Dam, as locals call it, is a mean engineering feat – 335m long and 98m high – an earth-fill dam wall that contains Australia’s largest artificial reservoir. The lake’s usual storage volume is 5,797,000 megalitres but its capacity to the top of the spillway is almost twice that. When the lake filled to capacity in the wet season of 1973, the spillway flowed until 1984! The 60km lake normally has a surface area of almost 1000 square kilometres (more than 20 times the size of Sydney Harbour). Almost 70 islands protrude from this watery expanse, the largest of which is Hagan Island, approximately 7km by 3km, with a peak (Mt Misery) that rises over 200m above the lake. Despite this huge capacity, The Ord River irrigation project faltered in its infancy because of difficulties growing crops and attack from pests. The original plan was to produce rice crops for export to China. However, these plans were scuttled as waterfowl, particularly magpie geese, ate rice shoots quicker than they could be planted. Next up, cotton was the focus of local agriculture. But low crop yields combined with a drop in world cotton prices lead to suspension of the commercial cotton industry in the region. 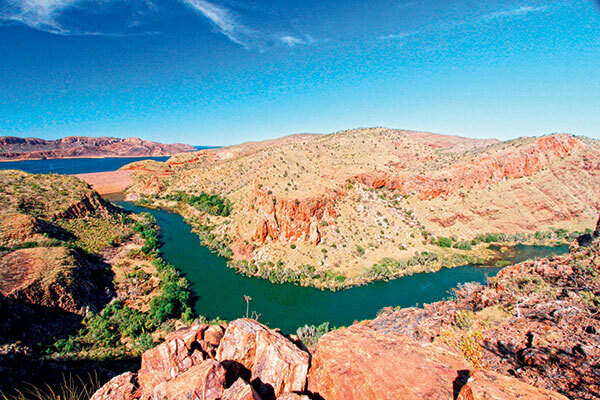 Today, Lake Argyle provides water for irrigation to about 150 square kilometres of farmland in the East Kimberley and there are plans to extend the scheme to almost treble that area in the near future. Although considered by some to be the most under-utilised lake in Australia, the irrigation scheme is seen by many local farmers as a huge success, supporting 60 different varieties of fruit and vegetable crops, including the largest commercial Indian sandalwood plantations in the world. Not only is the region fertile, it is rich in minerals too, with deposits of uranium, gold and copper. It is the home of Rio Tinto’s Argyle diamond mine, the world’s largest supplier of diamonds by volume, producing about 20 million carats each year. Argyle’s signature stone is the rare pink diamond, much sought after by collectors, investors and connoisseurs worldwide. These pink beauties may command prices up to 20 times that of a white diamond. 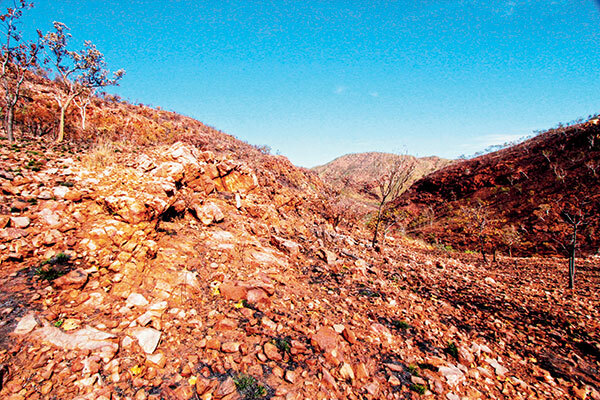 Full-day tours of the mine can be arranged in Kununurra. 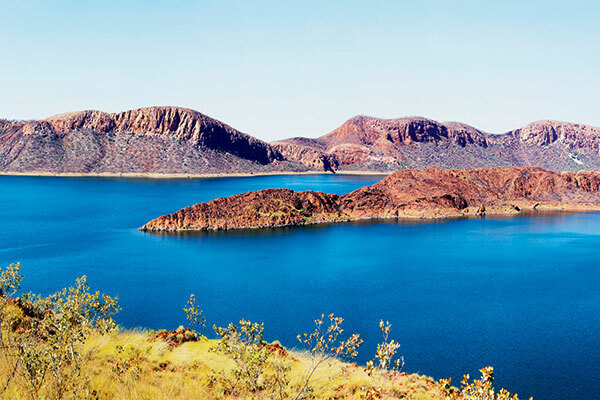 Lake Argyle is named after the property it partly submerges, Argyle Downs, established by Patrick Durack and his brother Michael, in 1882. The Duracks arrived in the area after droving 7250 head of cattle and 200 horses from their property on Coopers Creek, Qld, to stock Argyle Downs and Ivanhoe Station. This 4800km trek took almost two and a half years and was the longest drive undertaken by Australian stockmen up to that time. The Argyle Downs homestead was built by Pat Durack in 1895, using limestone blocks and mortar made from crushed termite mounds – an ‘unambiguously permanent’ structure, unique among pioneer homes in the far north. Ironically, the homestead has since been dismantled stone-by-stone, removed from its original site on the Dunham River and carefully reconstructed at its present location, a short distance from the Argyle Resort (to escape inundation by the rising waters of Lake Argyle in the 1970s). 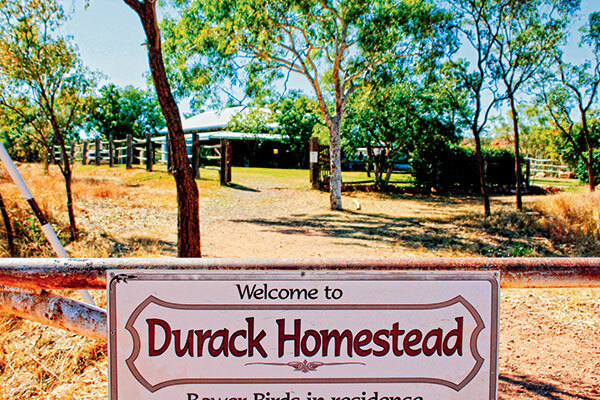 The homestead was reopened in 1979 and now acts as a small but impressive museum, housing memorabilia of the Durack family and other artefacts of early pioneering life in the Kimberley. 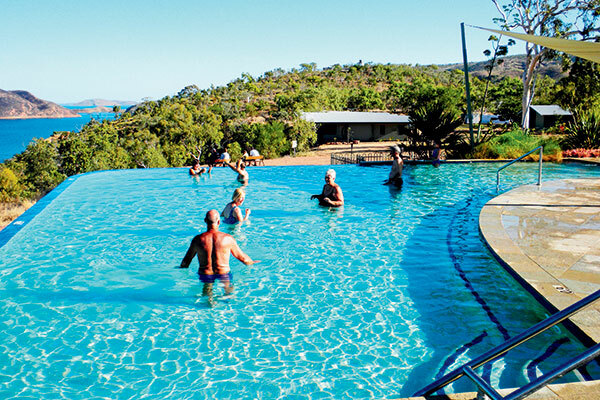 The Lake Argyle Resort and Caravan Park is ideally located on the shores of the lake to accommodate travellers with a taste for adventure. Fishing draws many enthusiasts here, as does the sailing, boating and water-skiing. For a more relaxed approach to environmental appreciation, you can sign up for a sunset cruise or one of the many scenic flights available by float plane. For land-based enjoyment, there are birdwatching tours and several bushwalking trails adjacent to the resort that explore the surrounding hills and valleys. For sheer relaxation value however, you can’t beat the 35m infinity pool – with a view overlooking the lake, it is billed (justifiably) as one of the most spectacular resort pools in Australia. The resort welcomes day-use visitors too, who can – for a modest fee – enjoy the use of the pool, gas barbecues and picnic facilities. Lake Argyle village is at the southern end of Lake Argyle Road. Access is usually via the Victoria Highway from either WA or NT, which although sealed can be impassable during the wet.